Are you ready to join the Justice League? Word on the street is that they need someone who has a mastery over the oceans! With those requirements for the next member of the Justice League, Aquaman may just be the man for the job! As the King of Atlantis, Aquaman is charged with keeping control of creatures under the sea. But his command of the ocean is also a welcome skill for taking on villains of all kinds. That’s what makes him the ideal founding member of the Justice League. Aquaman is always at the ready for doing what he can to keep peace and take care of the baddies on the loose in any city. 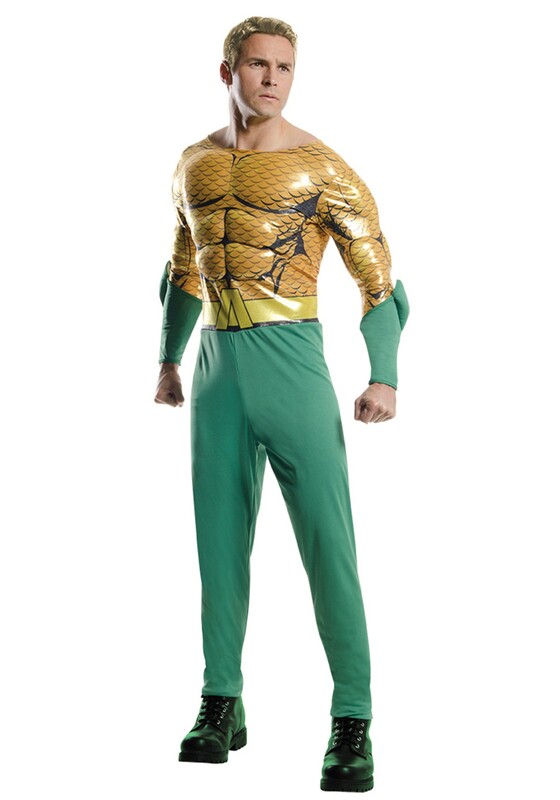 If you wear this Aquaman Costume you might just have a shot at the job, too! It's based on the classic DC character, so you'll have the look of a mighty superhero of the seas. Just remember to bring your trident to the job interview! This officially licensed costume comes with everything you need to look the part of the iconic superhero this Halloween. The printed jumpsuit looks just like Aquaman and it Velcros in the back for a secure and comfortable fit. What’s a superhero without big muscles that are ready to save the world? Good thing this jumpsuit comes equipped with built-in muscle chest and arms to get you pumped up for crime fighting! Add a pair of black superhero boots and team up with the rest of the Justice League for a great group costume this Halloween!